□ Implement the ICustomTaskPaneConsumer interface, which contains a single method, CTPFactoryAvailable. □ The CTPFactoryAvailable procedure is passed a reference to Excel's CTP factory class, which the Add-In stores in a module-level variable. 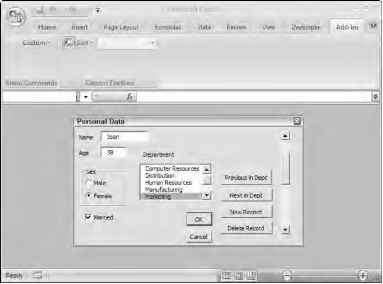 □ Design a custom ActiveX control to provide the content of the CTP. □ Create, show, and hide the CTP in response to a user trigger. 'Called by Excel when the Add-In is loaded, 'providing a factory object that we use to 'create custom task panes. It's enlightening to compare the way in which CTPs have been implemented to the RibbonX mechanism. For CTPs, when the COM Add-In starts up, Excel passes a factory class into the CTPFactoryAvailable method, which is stored in a module-level variable. You can then use the factory class to create new instances of custom task panes at any time you like. In turn, that allows you to very easily expose the new CTP functionality to VBA. In contrast, the RibbonX design requires you to specify all customization as soon as the COM Add-In starts, so you can only create one customization snippet and can neither expose the RibbonX features to VBA nor create dynamic interfaces that respond to the changing Excel environment. How do i display the action pane in excel 2007 using vba? Can I use the excel task panes in excel vba?